Coded data are a vital part of the health care information system. For example, these data are used for reimbursement at the facility and provider level, in quality outcomes reporting, and in public health statistics. With such far-reaching and impactful uses, the need to have accurate medical coding assignments is more important than ever. Applying this adage to coding audits, facilities and providers can identify and apply criteria that are likely to reveal coding errors or unsupported clinical documentation. These would both make the auditing process more meaningful than a random sample selection. Incorporating focused audit account sample selection often yields more effective revenue optimization than the random sampling method. This focused audit may include use of denial-trended data, cases with the potential for significant quality reporting impact due to inaccurate coding, and elements associated with high-risk coding practices. 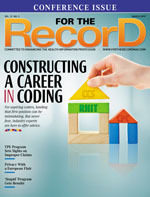 In her May 2018 article “Are All Coding Denials Preventable?” featured in the Journal of AHIMA’s Code Cracker blog, author Elena Miller, MPH, RHIA, CCS, notes that ongoing internal quality audits can be used to prevent payer denials. Denial trending, or analyzing the overall volume of payer-denied cases, can identify patterns of inaccurate code assignment and unsupported clinical conditions. These patterns can lead to focus areas for coding audits that may benefit from clinical documentation improvement or coding staff education. For instance, trended results analysis of denied accounts might show that when sepsis is assigned as the principal diagnosis code, there’s a corresponding increase in denials. However, if there is not an underlying localized infection included as a secondary diagnosis code, this scenario may be an area of audit focus going forward. All accounts meeting that criterion could be reviewed for accuracy of code assignment and supporting clinical information prior to claim submission to prevent further denials. The audit findings may suggest that the clinical documentation is supportive of the code assignment. The code assignment would be deemed appropriate or the results may show supporting the conditions with further clinical evidence is required. Regardless of the outcome, review of an adequate sample of accounts with the denial-causing elements identified and corrected through process improvement and/or education means a decrease in the number of denied claims meeting these criteria. Once this occurs, the provider can focus on a new area. By incorporating cases with a high probability of payer denial into the audit selection, the audit review process not only serves to improve accurate code assignment but also reduces the number of denials and in turn requires less resources to review and appeal denials, resulting in fewer payment retractions. Quality outcomes reporting, such as the Agency for Healthcare Research and Quality’s Patient Safety Indicators (PSIs), is another area to consider when selecting accounts to audit. Auditing cases that qualify for PSI reporting to ensure accurate and complete code assignment can impact a facility’s reported PSI rates. PSIs provide “information on potential in-hospital complications and adverse events following surgeries, procedures, and childbirth.” Inclusion and exclusion criteria for PSIs measures are based on the ICD-10-CM/PCS code assignment, discharge disposition, and other patient demographic data. For example, PSI 06—Iatrogenic Pneumothorax shows the rate of occurrence for iatrogenic pneumothorax cases based on a secondary diagnosis code assignment for this condition. However, there are several exclusion factors for the measure that are also based on ICD-10-CM/PCS code assignment. In light of the potential impact on quality measures, it is common sense for health care entities to audit accounts that meet PSI reporting criteria prior to final coding completion. Based on other conditions present or certain procedures performed, it ensures the case is not excluded from reporting. Auditing of these encounters may reveal the patient with an iatrogenic pneumothorax listed as a secondary diagnosis also suffered chest trauma with resulting rib fractures prior to admission, yet the coder neglected to assign the appropriate codes for the traumatic condition. Once the case was reviewed through an audit process and the code assignment was corrected, the assignment of an ICD-10-CM code for rib fracture would be excluded from PSI 06 reporting. The two previously mentioned audit focus areas were specific to health care facility coding audits. However, provider-based audits can benefit from meaningful audit sample selection as well. According to Schraffenberger and Kuehn in Effective Management of Coding Services, potential audit targets for physicians include evaluation and management (E/M) codes through a bell curve analysis and a comparison by physician or the percentage of specific CPT modifiers assigned. In the provider practice setting, physicians with bell curve distributions of E/M codes that are not comparable to the practice average should be audited to ensure compliant coding practices were applied with documentation supporting the code assignment. Keep in mind, however, that a difference in the bell curve distribution is not necessarily reflective of inaccurate code assignment. Incorporating provider reviews that fall into this category rather than random sampling of encounters from physicians that align with the practice’s average bell curve will prove beneficial in uncovering compliance and documentation concerns. It may also validate appropriately managed documentation and coding practices. • Instead of random sampling, focus on denied-claims data. Where denials are high, don’t just identify what corrective actions may be necessary to remedy the situation. It’s important to also make an effort to improve coding and documentation quality. • Review quality outcomes reporting such as PSI reporting criteria. Based on analysis of the PSI report, there may be additional coding audit criteria to review. • Take note of your provider reviews and compare them with your expected bell curves. Outliers should receive additional scrutiny during coding audits. Coding audits are a part of normal business practice for facilities and providers. While the audit process can be time and cost intensive, the values and return on investment far outweigh the efforts. A sample selection tactic that promotes meaningful account mixture, rather than the traditional random sampling of accounts, can provide a useful means to correct coding errors and identify documentation discrepancies. It can also address other areas of payer denials, quality reporting rates, and practice compliance. By looking at aspects of your facility or practice and determining what elements are likely to reveal errors, you can correct a targeted sample selection instead of leaving it to chance with a random sample. — Melissa Koehler, RHIA, CHDA, CDIP, CCS, CCS-P, is director of medical coding QA and consulting at Aviacode.